One of the classic forms of analysis tells us that major trend changes happen on lower time frames first. In other words, we will see a change in trend happen on an hourly chart, before a 4-hour. And we’ll a change in trend on a 4-hour chart before a daily chart. The problem with identifying the ‘real’ change in trend is that you often only know the trend changed on an hourly and 4-hour time frame after you notice the trend change on the daily chart. The reason for that is because there are considerable fake-outs that happen on smaller time frames. Nevertheless, it is important to identify the conditions of multiple time frames to determine how the current trend in one timeframe relates to another. That is the purpose of this article today. Not a lot has changed since we’ve last reviewed the daily Ichimoku chart. In fact, Bitcoin has remained in the same $140 range for the past 11 trading days. In fact, the constriction has been so tight that the Tenken-Sen and Kijun-Sen are currently at the same value area, indicating that the average of high and low of the past 26-days is the same as the high and the low of the past 9-days. And price has been oscillating above and below that value area. The Chikou Span is also trading flat and neutral. 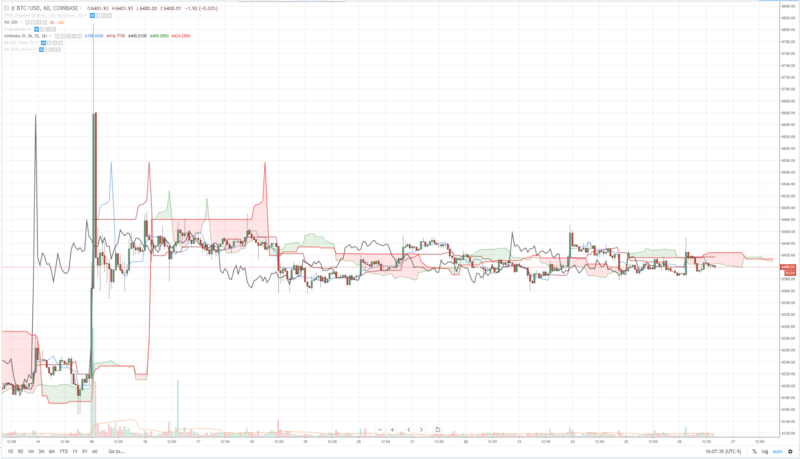 When Looking at the daily Kumo, it remains red and bearish, but both Senkou Span A and Senkou Span B are turning towards the middle of the Kumo. Volume remains weak and well below average, especially on the weekly. The 4-hour Ichimoku chart confirms the extremely tight trading range of Bitcoin. We can observe the Tenken-Sen and price oscillating around the Kijun-Sen. The Chikou Span is inside price action and is also oscillating above and below the Kijun-Sen. But there is one signal that the consolidation is about to end: Senkou Span A and Senkou Span B have the same value as the Kijun-Sen. This is evidence of some of the most extreme congestion we can view on any chart. If there were an indicator that could read over-congestion just like the overbought or oversold conditions in the RSI, then we would definitely be in an over-congestion zone. There is a much easier and clearer path higher on the 4-hour chart than the daily chart, especially given that Chikou Span and Price are such close proximity th top of the Kumo. A break above the Kumo is much easier with a thin Kumo ahead. The 1-hour Ichimoku chart shows the exact same conditions found them on the 4-hour chart. The exception here would be some evidence of a breakout being close. There are some selected and key volume spikes on the hourly chart which are indicative of further accumulation. Additionally, there is some clear evidence of ‘testing’ moves lower and higher – they appear to be an almost classical version of testing that used to be observed in individual stocks before the entire stock market became so correlated. 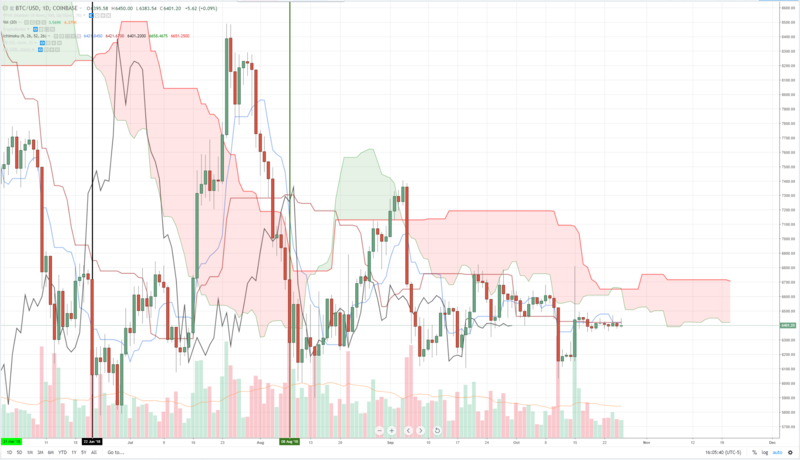 Additionally, we can observe that prices have spent most of their time below the cloud but any dip below the cloud has been met with strong and persistent buying. 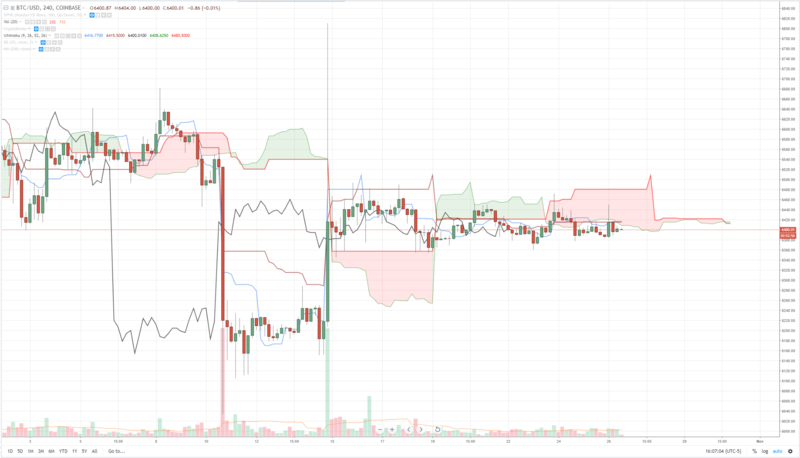 On the few breaks above the Kumo on the hourly chart, there has been resistance, but the pressure has not been nearly as strong. It is clear that the final breath of this 8-month long consolidation move is at its end and will begin a new trend within the next 9 days, there is very little evidence to suggest that long-term continuation of this tight range will or could continue beyond 9 more days. On the hourly chart, at least, any persistent move higher will be easy because the Kumo is extremely thin to non-existent.